Sting was feeling rather adventurous today. That was something uncommon about her, as she would usually stay cozy in the NightWings without getting her paws dirty, as she preferred. Since Sting didn't have anyone to talk to in the first place, she felt like she didn't have to come home worrying about explaining herself to her peers. Nobody knew her, so why would anyone care if she went missing? Sting didn't know what part of Pyrria she was at right now, but she kept note of where she was going by making marks where she passed. She kept in mind that if she ever needed to go home, she can just follow the marks. Maybe she didn't have to worry about that now, though. If Sting wanted to stay in the Rogue Lands a while, she can simply find a place to rest until dawn breaks. Then she can keep moving. However, it was then when Sting paused in her tracks to examine something she never saw before. It was a small shrub with budding pink flowers on its baby branches. The NightWing never saw such before. She took a seat on her bum to analyze it. "What the devil are you?" The twins smiled at the idea, especially Cyclone, considering she kind of made them lose that deer. Cyclone then looked at Sting. "Yeah. We could use some food. It been a while since we ate anything." Then Typhoon couldn't help but comment. "She may have scared a deer off before we ran into you." The red eyed hatchling just rolled her eyes at the comment. She was usually the one firing off a side comment like that, so the young 'ness figure he did deserve to get one out on her. Either way, they were both kind of hungry. After listening to the twins' exchange, the NightWing chuckled. "No problem." She wasn't great at hunting, but she was willing to recall her knowledge from her days as a Tracker Trainee. Sparked in her heart with determination, the citizen backed out of the cave, but not before saying, "I will be back shortly. Water is in the corner. Please make yourself comfortable!" With that, she bounded out of her den, ears pricked. It had begun to sprinkle, which was bound to make hunting harder since the wildlife would flee into their own dens to shield from the rain. However, it wouldn't hurt to at least see if there were any animals who were delayed in their return home. Shaking the droplets from her obsidian pelt, Sting then made her way forward in the beginnings of the hunt. Her prize wasn't outstanding, but hopefully it was okay. The NightWing trotted into the cavern with a stag in her jaws. It was small. . . Obviously a baby. Sting assumed that it was looking for its mother when it fell victim to her claws. "It's not much, but. . ."
The pair smiled at how kind Sting was to them. Typhoon was thirsty, so the pair got up and went to the water bowl. As the male hatchling began to take a drink, Cyclone started talking to him. "You know. This place is really nice. It almost feels like...."
"Home?" Typhoon asked while cutting his sister off. Cyclone smiled at the comment. "Yeah, bro. It feels like home." Typhoon smiled at his sister, who decided to go ahead and get water herself. The pair felt comfortable and safe in Sting's den, but something bothered him. This couldn't be forever, right? The Nightwing wouldn't just take him and his sister in, they weren't even part Nightwing. Why would she? Maybe he was thinking too much, and the hatchling decided to just enjoy it while he could. ""Hey, sis. Bet you can't beat me." The dragoness just had a happy smirk on her face. When Sting returned, she found Cyclone and Typhoon wrestling, quite an odd sight considering they shared a body. As soon as they noticed her the pair quickly came up to her, more than happy to see the small stag. Then the Nightwing tried to downplay the catch. Both looked at her with big smiles on their faces. "This is great!" The two dragons then happily began to eat the small catch. A small chuckle escaped Sting's maw as she laid eyes on the pair wrestling. She was happy that they enjoyed the stag she brought in, and she sat down nearby, purring. "I'm happy that it's suffecient," the dragoness said, "Eat as much as you like. I will go back out if you need any more." She meant it. She already felt a sort of defensiveness over the Twin Storms, and if they weren't happy she would be eager to help change that. She never felt this way for any guest before. . . But then again, Sting never had many guests. "Also," she went on after a moment of thought, "Feel free to stay as long as you like. My den is always open, too." She wanted the twins to stay with her a bit more. She really enjoyed their company. The pair smiled at the kindness Sting was showing them. She was willing to look for more food just for them! They hadn't had someone care that much since their human friends left them, who thought the pair would have a better chance without them. Cyclone then looked at Sting while Typhoon took another bite. "Thank you! This should be enough." There was also another odd thing. The glow of the Moonstone around each dragons' neck finally became apparent, dispite them having never really stopped glowing. Then Sting said something that stocked both twins. They could stay as long as they wanted, and they could come back! Cyclone's face showed her disbelief at this while Typhoon's maw dropped, causing him to drop the piece of stag that was in it. No one they had met had ever offered that. Typhoon finally managed to get something out of his mouth while his usually talkative sister stayed awestruck. "Th...th...thank you! I...I don't know what to say." He looked at Cyclone, their tail swaying and twitching back and forth, the two then bit down on the ham of the deer, managing to free most of it. The pair quickly walked up to Sting, Typhoon carrying the ham in his jaws, and Cyclone looking up at her. "Do you want any?" It was the only thing the pair could think of to thank Sting, and they really hoped she would take it. Wait. . . Cyclone and Typhoon weren't speechless out of frustration or hurt. It was happiness! The sight made a warm and fuzzy feeling stir in Sting's chest, and an involuntary smile tugged at the corners of her mouth. She was happy to excite the siblings. . . Yet at the same time, it made her feel a little down as well. If they were surprised at this, would that mean no one ever shown them as much love and kindness as Sting herself? Except, of course, their parents? Or could it be that in the rogue lands it's hard to find company in general? But Sting wouldn't know that. . . She was never a rogue. . . The kind NightWing gave Typhoon an affectionate nod at his comment, smiling. He didn't have to say a word. She then looked a bit surprised as they offered her some of their food. . . Such manners!! Such kindness!! Sting grinned. "That's very nice... Thank you!!" Cyclone and Typhoon both smiled , happy that the Nightwing had accepted the small gift. They then happily went back to their meal, finishing most of it before they were full. Then Typhoon got the bright idea to use one of the bones as a toy. The pair hit it back and forth, trying to keep the bone from hitting the ground. It didn't take long for this game to tire the twins and they soon got into the guest nest. Then Cyclone looked over at Sting. 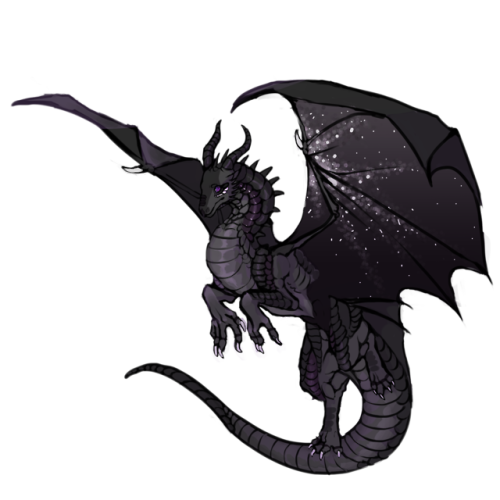 She loved that the dragoness seemed to care about her and her brother, but she was still a little curious about the black scaled dragoness's life. She then opened her maw, somewhat hesitant to speak. "Um, Sting. Do you have any family?" Sting, after eating the meat, laid her head on her paws whilst laying in her nest. Even if she was tired, how could she sleep with these two around? Oh, no, not in a bad way. . . Watching them play gave Sting a sort of happiness. It not only tickled her, but it made her happy to see them happy. And. . . The NightWing felt defensive of them. She didn't realize it until she was hunting earlier. She noticed how she was suddenly uneasy about the twins being alone without her. Almost like a mother. . . So this is what the dragoness thought about when Cyclone asked her of Sting's family. She knew she had Exodus, a NightWing Rogue and a mother she never knew. Exodus had told his daughter before that he had hatchlings with another dragoness in the past, so that would mean Sting had a handful of siblings as well. Exodus, however, no longer had Sting's back and left for the rogue lands as soon as she was an adult and capable of taking care of herself. "I had a father," Sting began with a nod, her gaze trailing around her cavern. "His name was Exodus, and now he is a Rogue. . . I don't know who my mom was." And frankly, she didn't care either. Her mom, whoever she was, was never part of her life. If she left her daughter, why would Sting give a deer's pelt for her? "I know I have a handful of half-siblings too, but I never met them." Here it was. . . Sting was shaking as her gaze flicked back to the Twin Storms. What if they said no? "You. . . Well. . ." She smiled. "Cyclone, Typhoon. . . We can be family. . ."
Both twins listened intently to Sting as she described her family tree. They felt a bit bad for the dragoness, finding it hard to think about not knowing who their own family. And then she dropped a bombshell on the pair. She...she wanted to be a family? She wanted to be their mom! Both looked at Sting, absolutely stunned at what she said. Neither could quite believe what they heard. Since their parents and aunt were slain, and their brother was captured, Cyclone and Typhoon didn't really have a family. Now, Sting was offering this back to them! It didn't take long for the pair to run up to the dragoness and jump on her, hugging and thanking her with tears in their eyes. Cyclone then looked up at Sting, tears of joy still in her eyes. "Can...can we call you mom?" Sting was afraid she would be shot down. . . However, she was faced with her own pleasant surprise along with the twins' as she was suddenly glomped. When the NightWing looked up, she saw tears of ecstasy were in the eyes of Cyclone and Typhoon. . .
My children. . . ! Sting was purring so loud she was surprised the ground wasn't trembling. She wound her neck around the necks of her babies, closing her eyes. A single, fat tear rolled down her dark cheek. The dragoness rose her head and gave both of her hatchlings an affectionate lick on the snout. When Cyclone asked if they could call her mom, Sting smiled so much. Her reply was. . .
"My Twin Storms. . . Please do."